The results from MARTA’s in-person and online surveys clearly show that Atlantans want BeltLine rail to be a spending priority. MARTA is currently working on a project to prioritize transit projects that will be funded through the “More MARTA” tax — that’s the one that City of Atlanta voters approved in a 2016 referendum, funding intown projects only. According to an email from Atlanta City Councilman Amir Farokhi, the transit system is finalizing a few package options of projects to present to the public for comment and input in May and June. 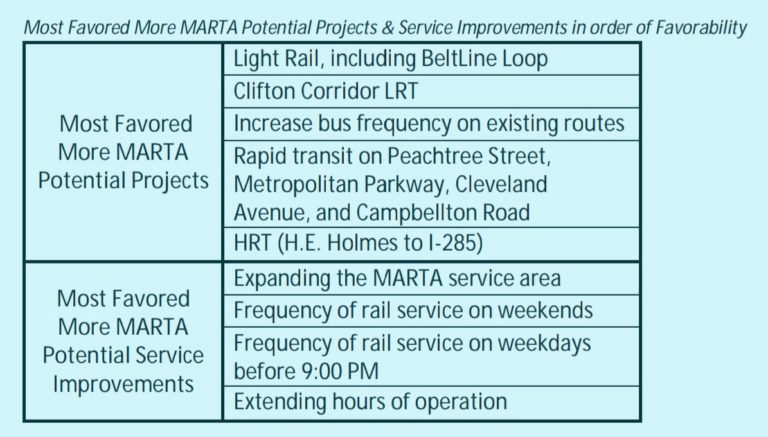 Looking at the survey results from that public process, linked below, there’s no room for doubt: if MARTA is going to respect the input Atlantans have already given, then BeltLine rail will need to be on all the lists of projects and priorities for this spending. It’s what voters expect to see their money spent on. Below, you can download the full report from the in-person responses to surveys that were handed out at the MARTA public engagement sessions last year. 133 respondents defined how they want the referendum tax money to be used. 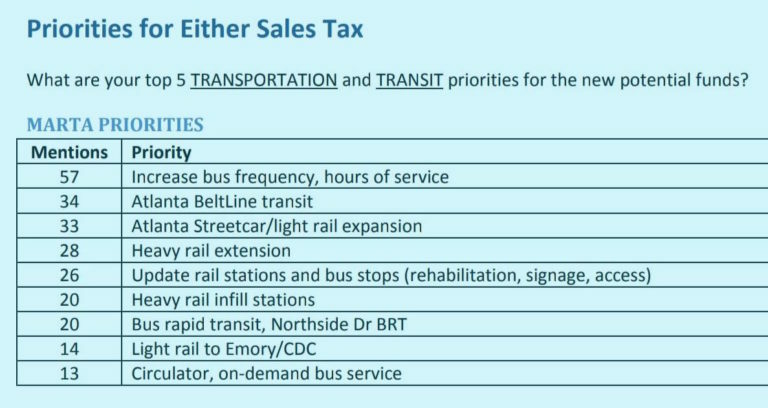 The “MARTA Priorities” box in the document shows BeltLine transit to be a high priority. In another section of the report, the item “Expansion of Atlanta Streetcar/Light Rail, incl. the Atlanta BeltLine Loop” was market as being Very Important by 70% of respondents. By prioritizing the BeltLine rail we would not be hurting other projects. 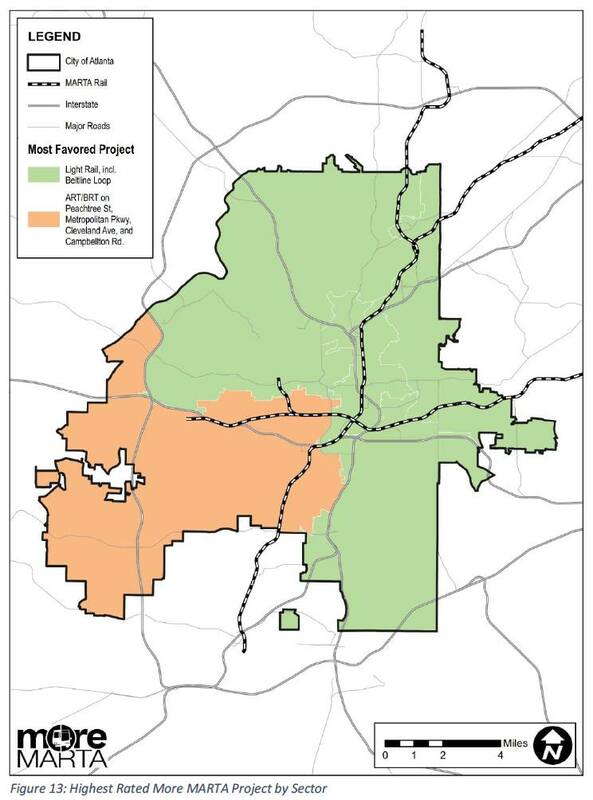 For instance a plan for Bus Rapid Transit to Campbellton Road from Peachtree is very popular, naturally, among people who live in that corridor of southwest Atlanta — just look at this map showing the support for it, in orange (green = areas where people but BeltLine transit on top of the list). The More MARTA tax can cover BeltLine Rail, Campbellton BRT and more. What’s important is that we prioritize these things that Atlantans have shown a passion for within this engagement process. It’s important that the City maintains trust with residents by respecting this public process. Even if it wasn’t for the feedback from the public about spending the More MARTA funding, prioritizing rail on the BeltLine still makes sense. It’s been established by studies that there’s a relationship between access to good transit and economic mobility. This is about equitable outcomes for the people who live in neighborhoods all around the route. Previous Previous post: Is Atlanta becoming a top biking city? Maybe something even better? Next Next post: Atlanta’s population density: are ‘we full’?